Becoming a Learning Organization: Any Signs of Progress? 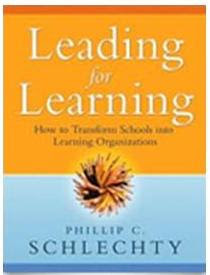 My current reading for my airport/plane time is Phil Schlecty’s book, Leading for Learning, How to Transform Schools into Learning Organizations. I am still early in the book. It’s intriguing for me to read Schlecty’s descriptions of how the education reforms of the 1960’s and 1970’s were prevented from changing schools due to the social systems in school organization. Its déjà vu as I consider what many school leaders face in their work at transforming their schools today.Using the work of Peter Drucker and Peter Senge, Schlecty lays out a comparison of bureaucratic schools and learning organizations (pg 42). As I read each of these descriptions I reflected back on my observations and experiences in classrooms during the past few weeks. You might wish to put these descriptors in front of a PLC, faculty, or principals’ meeting and explore how they align with your “desired” state and compare with existing practice and direction. In learning organizations, students are viewed as volunteers rather than conscripts, and it is assumed that for them to learn what the community wants them to learn, they must be provided with work that has qualities and characteristics that respond to the students’ own motives…A well articulated set of norms places task engagement and profound learning at the center of the school’s system of values and clearly defines the core business of the school as the creation of engaging work for students. I was in a K-8 school the day before the kids arrived. As I walked past several rooms and glanced in from the hall, I saw that teachers were prepared! On each student’s desk were stacked 3-6 text books, ready to greet the students as the entered the room. Does that say volunteer or conscript to you? Engaging work? I read it as the texts (the teacher’s agenda) trumped any interest in student motive. I observed 5th grade students working in groups answering science questions with discussion, text, and teacher support. Those who finished early had a word find worksheet. Engaging work? I observed a Kindergarten class where students worked at 8 different centers. As the teacher flowed from center to center, her questions, feedback, or encouragement seemed to heighten engagement. From students at the reading (books) center, I heard a five year old turn to a classmate, book displayed, announcing, “Oh my Gosh! You’ve got to see this!”. Students’ motive and engagement? In learning organizations, teachers are viewed as leaders, designers of work for students, and guides to instruction. The principal is expected to be a leader of leaders within the school, as well as a member of the superintendent’s administrative team at the central office level. I observed and conversed with a first grade teacher giving her students a benchmarking math test that she was convinced was painful to her students and valueless to her as the teacher as it gave no data that would direct her instructional decisions. She stated she was told to do it. Leader/designer? In the school where I saw the textbooks on desks, I mentioned it to a small group of teachers. They discussed it and got an idea for change. After a quick check in with administration they shared their ideas for the opening day of school with staff and designed a plan that was implemented the next day. Leader/designer? I am working at a middle school that created a self contained unit of over-aged students with pairs of teachers who provide instruction with the hope of preparing students for entry to high school in two years instead of three. The students who completed the program last year are having initial success at a level that has the high school interested in studying the program. Teachers in this program have designed learning outside the school, brought community members into the school, and raised the funds for these activities. Leader/designer? I attended a PLC meeting where teachers were convinced that their current instructional activities were not creating the desired student learning. They complained about what is wrong with the curriculum guide and materials and were convinced they were powerless to change anything. Leaders/designers? The idea of continuous innovation aimed at continuous improvement is embraced as a core value, and behavior is guided by clear moral and aesthetic norms combined with a fluid set of technical norms. Are you becoming a learning community? My reflections uncover enough movement toward becoming a learning community to get me back on a plane this week and enough non examples to tell me I can stay at this until forced retirement.